Aisling O’Keeffe graduated in psychology this year. 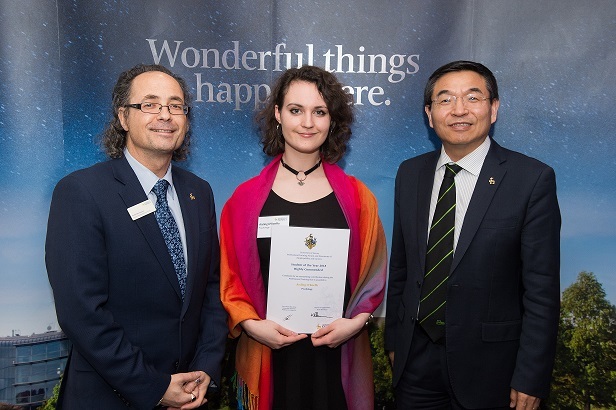 She received a Highly Commended Award at the Student of the Year Awards in April. Before she starts her graduate role she found some time to tell us about her placement year working at the university. I worked as a research assistant for a reader in developmental psychology for my placement year. My main duties lay with my supervisor’s research projects and so, I found myself happily and actively involved in the collection, organisation, input, transcription, basic analysis, and the coding of both quantitative and qualitative data across studies varying in both topic (e.g. gender, rights, learning etc.) and age range (4yrs-25yrs). I had the luck to work for a supervisor who encouraged me to engage with any or all of the projects they were running and, as I worked 4 days a week, allowed me to utilise my 5th day to work under various PhD students in order to give myself a wider range of projects and equipment learning (from biopac equipment to kazoos). Needless to say, I was certainly never bored! The insight I gained into the day-to-day running of a university department was invaluable. Whilst on my placement I visited departmental meetings and visiting lecturers talks. I also joined the Athena SWAN committee for the department as their undergraduate representative and created a media review template which is now the recommended practice! Having entered my placement year hesitant and nervous I received encouragement from my supervisor and visiting tutor which helped me grow a keen sense of proactiveness and self-confidence. This led to me being able to hold my own at a conference held at UCL; engaging in debates with seasoned professors and lecturers. Entering final year I had learned skills and software which assisted me in my studies and my dissertation. I had also learned to balance my time effectively, and I strove to emulate the 9-5 working hours which had become my norm over placement. I was now self-assured in my abilities within a research environment and sought a job which could further the skills I had already gained. I am thrilled to say that when I attend my graduation ceremony I will be a couple of weeks into my new job role as a research executive for an independent research company; creating and managing projects. I have no doubt when I say I owe this job to the experiences I had over placement year and the connections I made whilst there. My advice to those who have not found a placement yet would be to be patient and proactive with a solid side of perseverance! If you haven’t spotted a job which suits you – then seek out one that does. Think less about what you can’t bring to a role, and more about what you can bring, and what you want to develop. My placement gave me an understanding of myself as an employee, and a clear idea of the roles I would thrive within in the future. I definitely encourage others to seek out their own.